Studies show that children who play and listen, engage and reflect, alternate active movement with songs, poems, stories, verses, and develop strong pre-literacy skills through the imagination, those children simply excel as adult life-long learners! Consider the education you offer to your children at ages 3, 4 and 5. Will it nurture their imagination, will it positively affect them throughout life? Shining Star’s Early Childhood program strives to meet a child’s need for social interaction, play, and learning to make and be a friend. Our program fills their hearts and minds with stories that are positive, influential and character-building. Is it a dreamy day of play and fun, healthy snacks and outdoor time. In the Early Childhood Programs we serve daily organic snacks, bake, make soup and enjoy festivals and seasonal crafts. 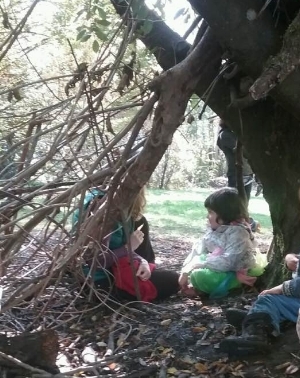 Our mixed-age Kindergarten offer sweet nature play, organic snacks, seasonal stories and poems, singing, crafts, and community for young families. Smaller class sizes allow us to spend lots of quality time with each child. After care is also available from 1:00 to 3:00 p.m.
We have a fantastic outdoor program, Wild Nest, led by naturalist/Waldorf teacher Elisabeth Neeley. The program is offered Friday mornings from 10 am to 12 noon for children five years and younger, with their parents, to spend time outdoors, year round. Please contact office@shiningstarschool.com for more information and to obtain an application.